Oh this one is cute.......seriously cute! It is called Beary Big Adventure. Confession time, I actually used an old Sketch Challenge for this one.........if you're stuck for a card design idea it is a really good source of inspiration. 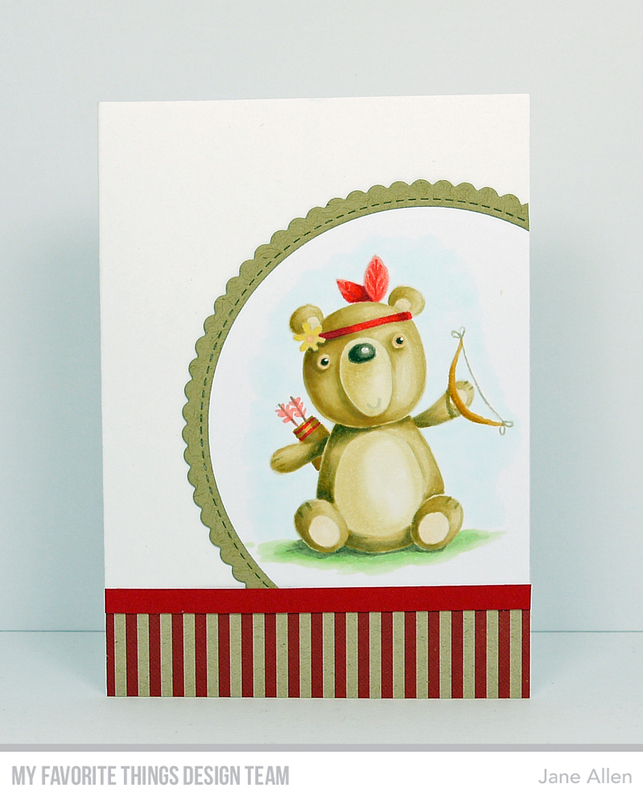 Anyway, I used Kraft Collection Solid Stripes at the base with a band of Cherry Crisp card, which reminds me..... Have you seen the new additions to the Printable Resources section - you can now get colour matches for all the paper packs - have I mentioned how much I love the guys at MFT!! Oops, nearly forgot the Kraft card frame I cut using a Stitched Circle Scallop Frame die. As to the colouring......you know the routine by now, I stamp the image on Copic card using Hybrid ink in Cement Grey and then colour like a woman possessed with my trusty markers. For those who like to play along here is the Copic list. Thank you for dropping by today, I will be back on launch day.........not long to wait now!! You probably hear this a lot but, I love your colouring. Thanks so much for including the markers you used in your fabulous creations. Your no line coloring is so perfect. It is such a great look. The gorgeous coloring really makes the beary Indian pop! How cute!Thank you for the inspiration! Your coloring is amazing! The eyes are so life like it just brings it alive. Awesome job!